Does it make any difference if something is true or false? To your subconscious - NO! It can’t tell the difference between truth and fiction. Everything (and I do mean EVERYTHING) you tell yourself is accepted by the subconscious to be 100% true, without exception. You say “I always remember faces but can’t remember names” and the ever serving subconscious makes this a reality. You say “I am not a morning person. I can’t wake up until I’ve had at least one coffee” and your subconscious obliges your wishes. You say “Everything I eat goes right to my hips” and guess where you always gain weight! You say “I’m stupid” and the subconscious works diligently to prove that yes, you are in fact stupid. Whatever you are thinking or telling yourself, the subconscious believes it to be true and works outside of your conscious awareness to prove you are right. People “lie” about their limitations all the time. We limit our success with some of the most ridiculous lies because they are what we believe to be true. A perfect example is how most of us, especially if we started with limited education or finances, believed throughout our entire adult life it would be impossible to change our life and achieve our dreams. The adult population has matured believing that success required great sacrifice, long hours and hard work. Now there are teenagers with less education and starting with no money who have attained extreme wealth. Everyday more people are learning their ability to achieve is only limited by their beliefs of what is truth or fiction and how they too can accomplish their goals. Everyday humans are learning to expand their minds, change their beliefs and experience greater and greater power within their own minds. You are designed to be the master and the subconscious is meant to be your slave. Unfortunately your current mental programming is full of negativity and self-limiting beliefs running on auto pilot to control you. Pretty much every self-limiting belief you currently have started out as a lie. As a child growing up, you made decisions regarding the lifestyle you would live. At the time you made these choices, they had not yet become reality and were in fact a lie. Your belief in these choices made them become your reality. The lies (negative beliefs) you and/or your primary caregivers have unwittingly programmed into your subconscious through repetition. With this understanding of how your subconscious was programmed with lies, you can now begin to re-program with a new set of lies. With constant repetition and perseverance, these new lies will eventually become your new beliefs. You will then begin thinking and acting in accordance with these new beliefs. You say “I choose to quickly and easily recall people’s names” and the subconscious will pop someone’s name into your consciousness the instant you want it. You say “I awake each morning full of energy and vitality, anxious to enjoy another day” and you will discover an energy level you never knew existed within you. Don’t take my word for anything I have stated. Prove it to yourself with a simple brain lesson! 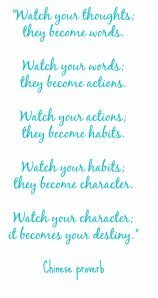 Pick a character trait or habit you don’t want. Start with something that is fairly small so you will see success quickly and can then build up to larger successes. Tell your subconscious what it is you “choose” to be or do and see the results almost instantly. Keep practicing for 21 to 30 days and it becomes a new habit. This is a perfect example of how I was training my subconscious with a lie (false belief) to effectively make it a true belief – I couldn’t remember names. Now, I am happy to say I do in fact quickly remember names. This might seem like a small victory, but to me I used to get so red faced and embarrassed when I couldn’t recall a name. If you look closely at what I accomplished, I simply started out with another false belief – I quickly and easily recall peoples’ names – and kept repeating it to myself until it became a true belief. My subconscious worked behind the scenes to prove I easily recalled names. Once you prove to yourself how your subconscious mind cannot tell the difference between truth or fiction you will quickly change the way you view your abilities and potential. I must caution you here. 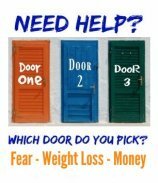 If you decide to tackle a large problem right from the start, such as a major weight loss or quitting smoking, you will not see immediate results and become discouraged. Being discouraged, you falsely believe this system doesn’t work. Therefore, start small and get your subconscious trained to give you what you desire. Take back control of your subconscious mind and tell it what "you choose" to accept as being true. Hopefully you now realize nothing is true or false, it is only your thinking that makes it so. Let's keep going and look at the next scientific brain research discovery. Click the link to leave this section "True or False" and go to "The Reason Self Help Fails"